Since becoming a parent I have seen maths in many places I wouldn’t necessarily have thought I would have. The playground (or park) is one source that just keeps giving. 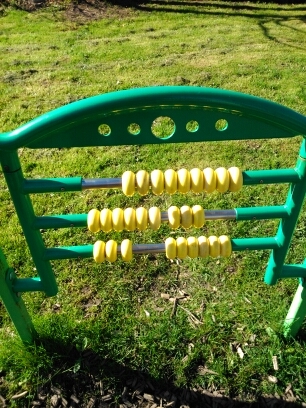 A week or two ago we were at a new playground and I found this abacus, and of course the maths links to an abacus are obvious, but what else is there? 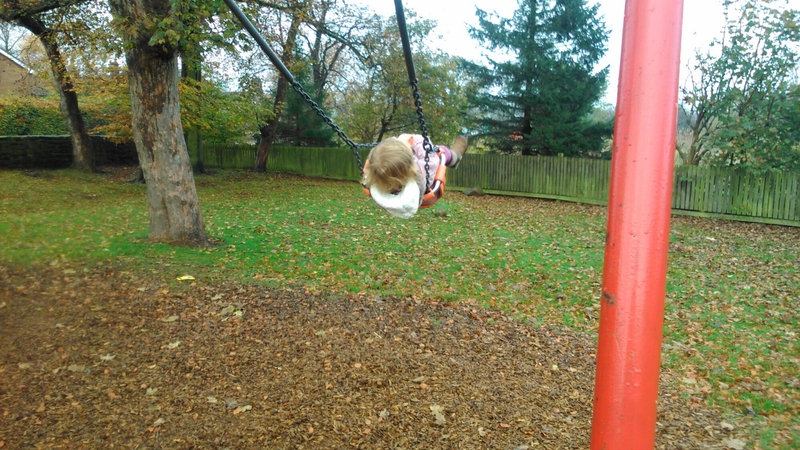 Last year I was pushing my daughter on a swing and I couldn’t help but see the swing as a pendulum and wonder whether we could take a physics and maths cross curricular trip to the playground and investigate the simple (or more likely damped) harmonic motion on display from the children’s swings. I think the mechanics involved would be interesting and different swings could be tested to see which ones are more efficient. Given that some swings are extremely noisy, I would assume that these are the least efficient and would love to test this hypothesis. Today I had another thought about playground maths. My daughter was playing on the roundabout, and after a while she got off and decided to start picking up the bark chips that cover the floor and plonking them onto the roundabout. We told her to stop and to spin the roundabout as that should make the chips fall off. She did this but the chips didn’t move. This was due to the fact her spin didn’t have enough speed to generate a centripetal force big enough to cause a reaction (or whispers centrifugal force shhh) larger than the maximum frictional force acting in the bark. 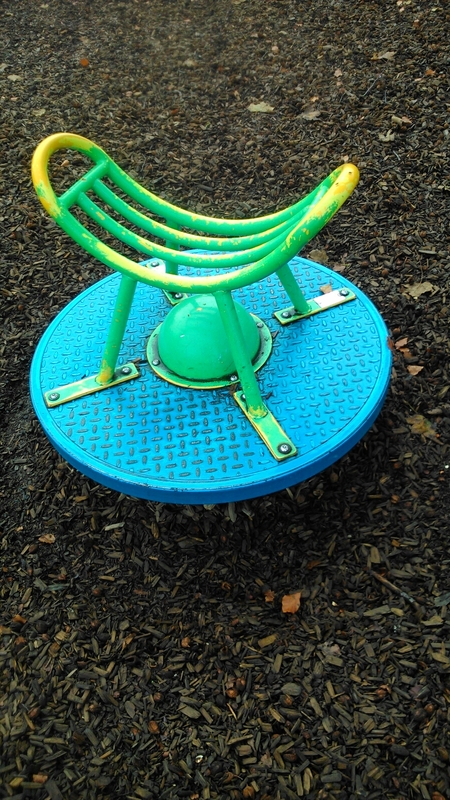 This made me wonder how large the coefficient of friction would be between the painted metal roundabout and the bark chips and what the minimum speed required would be to move them. Again, I figured a cross curricular trip would be great to investigate this too. I didn’t have my phone handy, so couldn’t photograph the chips on the roundabout, or film the sight of them flying off quickly when I gave the roundabout a spin! There you have it, children’s playgrounds, the perfect school trip for A Level maths and physics! Those of you that have read previous posts on Abaci (Here and here) will realise that I have been on the lookout for one that works in our base 10 society. All the simple abaci that are available seemingly anywhere in the country have 10 beads per line, but this doesn’t work. You move zero beads for zero, one for one etc and then when you get to ten you move the nine back and one from the next row across. These ten bead abaci have a bead on each row that will never move! I was in a state of shock, at first I couldn’t believe my eyes, so I went for a closer look, and sure enough, there it was. An abacus with 9 beads per row. Finally one that makes sense in this society!! well done Leeds City Council. Last night, while watching the TV I saw an advert that both intrigued and insensed me. 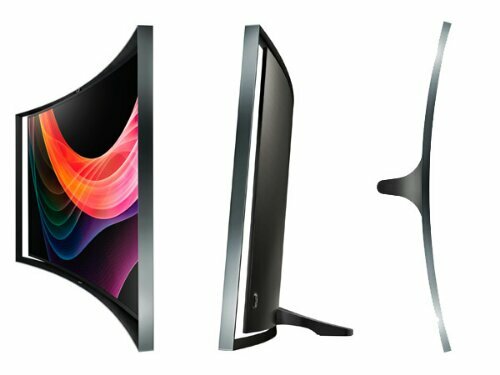 The advert in question was for a curved TV. It claimed to be curved in order to give you a better viewing experience. My first thought was “Parabolas are coming up with my further maths group, perhaps there’s a lesson in here?”, this was the intrigue, and it was quickly followed by the anger, but more on that later. Presumably these TVs have been designed to give the viewer the best view, when sat at the focus of the parabola. This is a fantastic real life use of a parabola, and means that this year I will be able to contextualise a lesson that was pretty abstract when I taught it last. I intent to investigate these TVs this week and build them into lessons if possible. I wonder if there is any benefit to positioning them so the wall behind them us the directrix? If there isn’t, I might decide that the folk in my contextualised question want it that way for aesthetic reasons, and/or because they are maths geeks! The annoyance came while thinking this through. I thought, “how have they calculated that?”, then, “ah, yes, Parabolas, I can see that sitting at the focus could in theory make it all look better,” then, “but what if there is two of you? !” As far as I can tell, the boffins behind this have taken an already anti social activity and made it more so. As a general rule, I will turn off the TV and put music on if we have guests round. (Obviously, if the purpose if the visit is to watch a rugby match or some other such TV event then it stays on). This is something I have done since the end of the last millennium and started when I was in sixth form. It was prompted by the realisation that TVs killed conversation. This realisation came because a friend of mine lived on her own without a TV and her flat was much more conducive to conversation and good socialising than anyone else’s. It was due to there being no TV to such the life out of the conversation. So TVs can be antisocial, but people often watch them together with friends, with family etc. But if your TV is parabolic, then the person at the focus benefits, but everyone else loses out! The logical conclusion to this new “advancement” is that everyone will have their own TV, families lined up watching their own TVs presumably with headphones, to enable them to all watch different stuff. It’s not how I’d want my future! Of course, I don’t really envisage the world ending up like that (although I suppose I can imagine it). I doubt they’ll take off large scale. Some will fall for the marketing and regret it, most will ignore them and these parabolic telly’s will wind up being forgotten by all. With the possible exception of gamers, who already spent hours locked in isolation only communicating through headsets to the other members of their online world’s. In July I became a father for the first time. This is an immensely wonderful, emotional and at times terrifying experience. After the birth you are very much left to learn by doing, and we have been enjoying parenthood ever since. 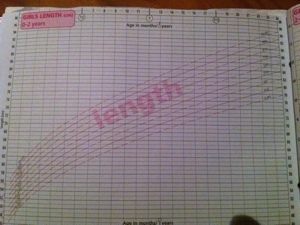 One of the things they give you when you become parents is “The red book” (http://www.rcpch.ac.uk/PCHR). In this book the health visitors/midwives and Dr’s keep everything they write about your child, and there are bits for you to fill in. 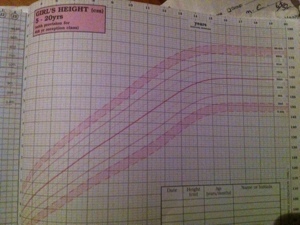 The bits that captured my interest the most were the charts at the back pertaining to baby’s weight and height (length). 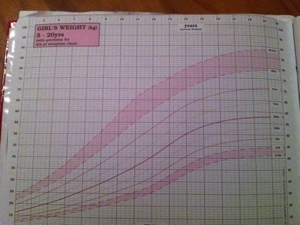 My daughter was born at the 50th percentile (the median) weight for a little girl, but very quickly jumped up to the section of the chart between the 67th and 91st percentile, and is now moving along at the 91st. 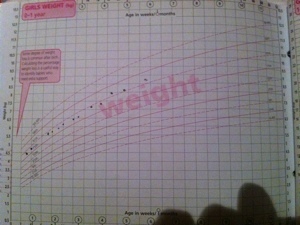 My partner and I were looking through the book last week and noticed that she (our daughter) had never been measured for length, I looked at the chart for her age and the 91st percentile and said, “she should be 68 cm long.” We then measured her, and she was ever so slightly over that (68.2cm). We were quite amazed by how accurate the chart had been. I wonder how they work it out? I assume there is a huge bank of data records and that these were probably normalised and the charts derived from the normal distribution, but I would love to see the full report on the maths. The databank must be massive! All babies born since ”records began” !!!! Obviously hypothesis 2 and 3 are untestable, and as such a thought experiment. However, check back here in 20 years time to see how accurate hypothesis 1 is!